In a world filled with superstitions and strange beliefs, it is not surprising that lottery players take heed of certain superstitions when playing. One of the biggest fears of bad luck involves the number 13, to the extent that airlines do not have a Row 13 on their airplanes. In light of this, the unluckiest day of the year- Friday the 13th – would not be the day of choice for lottery hopefuls. Nigel Willetts, a 48-year-old pub landlord from Bedwas, Wales, defied all odds and purchased a lottery ticket on the unluckiest day of the year. The result? His luckiest day yet! Willets decided to go against all odds one superstitious Friday the 13th afternoon by spending £20 on lottery tickets at a Tesco store in his local town. Not naturally a superstitions fellow, Willetts shared that when he realised he had bought a lottery ticket on Friday the 13th, it did stay on his mind for a while. Willets only saw the results on his phone on Saturday during a gap he had from working at his pub, and asked his partner, Jane Whittingham, to double check what he was seeing. In sheer disbelief, both Willets and Whittingham rushed down to the Tesco store to ask the cashier to confirm his win. Only after hearing it from someone else did the reality of his big win kick in. Even more surprising was the fact that he was the only raffle winner in Britain, beating odds of 13 million to 1! After realising that he was, in fact, a millionaire, Willet and his regulars had an eight-hour celebration at his Bridgend Inn, offering drinks on the house to all his loyal customers. His celebratory drink of choice? “My usual tipple, cider and black – about eight pints of it.” The festivities ended at 6am the following morning, with family and friends having poured in from all over to share in the good news. Willet is only licensed to stay open until 1am, but being a new millionaire, he didn’t care. With the world at his fingertips, Willets decided to keep the pub open. He shared that he loves his pub and that his customers mean the world to him and all the money in the world wouldn’t make him give that up. 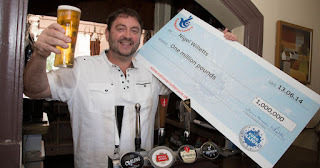 He used part of his winnings to pay off the mortgage on the pub with the aim of finally making it his. In addition, he purchased a new Range Rover, and went on holiday with Whittingham to the Maldives. Willet is a father of four and a grandfather of two, and planned to care for his family to ensure they were well looked after. It only takes one daring soul who challenges common belief to experience a life-changing win! Whether the supernatural are revered or not, players can take their luck into their own hands and determine their own destiny. Willets is living proof that the odds may be stacked against you, but you will come out triumphant! A quick trip to the shop and a cool £250,000 in the bank!